As the anniversary of Brawn GP winning the 2009 Constructor's Championship passed last week there was very little mention of it in the media. Perhaps it's because Mercedes GP, who bought Brawn GP, don't want to give PR to the success of it's predecessor. A more plausible reason, however; is that Ross Brawn has come down to earth with a bang this season with his efforts for Mercedes resulting in 4th place in the final standings. Not much to shout about there. At this stage Brawn GP is thought of in sepia tinted memories, the glory story of 2009 when Ross Brawn dragged the bones of Honda onto the 2009 grid to become Champions. But since then the bespectacled one has stepped back into the giant shadow of Mercedes and has been pushing the buttons to try to make them Champions instead. Unfortunately its not working; not that anything in F1 comes easy mind, a gestation period is normal for any new team trying to make an impact. Perhaps we mention Ross so little now because Michael Schumacher has been attracting all of Mercedes' bad headlines for him. When the 7 time Champion came out of retirement we expected a swift high-five from Ross and that the proven ex-Ferrari combination would mean the champagne would soon flow once more. Alas it's been a trying season for the German but one where he has improved as the season progressed. From the nadir of Singapore Schumacher has found his way out of the naughty corner and into serious points territory. You may recall Red Bull finished off the 2009 season in similar strong form which was carried right through to this season. If that's a reliable precedent then Schumacher should make huge inroads in 2011. 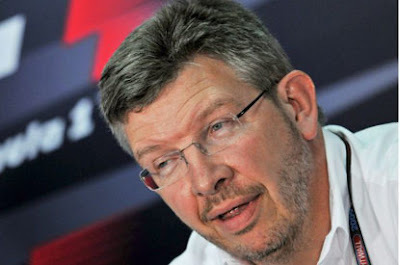 And if that happens you can expect to see the once familiar sight of Ross Brawn on the podium collecting the trophies. In the meantime though the feats of 2009's Brawn GP should not be forgotten. Although 2010 has been unkind to Mercedes GP a mind like Ross Brawn's will never rest on laurels.